Repair with calcified tissue, giving union across the fracture. Healing with calcified tissue and connective tissue. 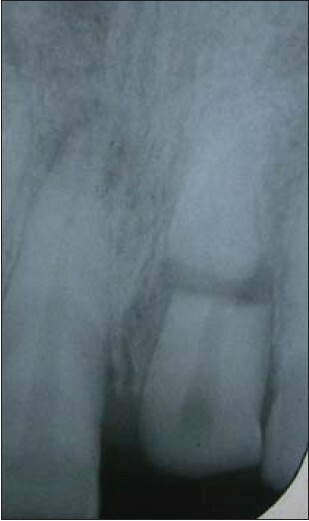 The last mode of healing with granulation tissue is a sign of pulp necrosis and an indication that endodontic treatment of the coronal portion of the tooth is necessary. Pulp capping, pulpotomy, or pulpectomy, and root canal obturation are alternative treatment strategies, depending on the maturity of the tooth, size of exposure, and duration between injury and treatment. 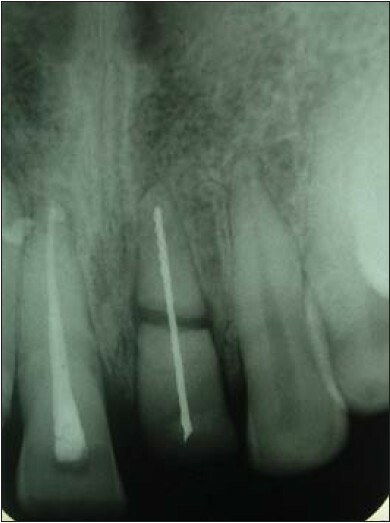 However, there are cases of horizontal root fractures with signs of healing without any treatment. Additionally, the horizontal root fracture cases showed a higher number of pulp-vitality preservation than luxation injury cases without root fracture. In the treatment of root fractures, it is recommended that the displaced coronal fragment should be repositioned and then splinted. 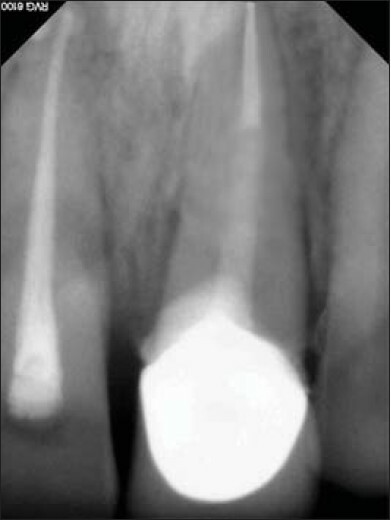 This case reports presents a case of maxillary left central incisor with root fracture treated endodontically, after approximating the fragment segments with the help of orthodontic appliance. A 22-year-old boy met a road traffic accident and reported in the department after 3 weeks. Soft-and hard-tissue examination showed no signs scarring. The left central incisor had a crown fracture [Figure 1]. 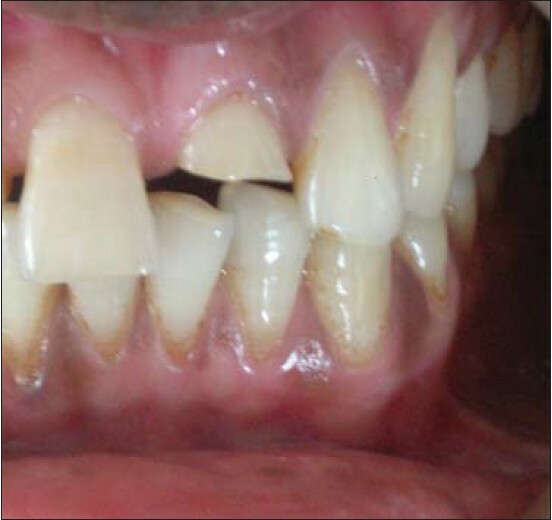 The tooth was asymptomatic with no spontaneous pain, no periodontal inflammation and no signs of fistulae. There was no pain or tenderness on palpation of the soft tissue. But there was pain on percussion. The tooth tested non-vital to electric pulp tester. Radiographic examination revealed no peri-radicular pathology, but a clear fracture at the middle third of the root was seen with the displacement of the fractured coronal segment coronally as well as distally [Figure 2]. A widened PDL was apparent surrounding the fracture site, but the PDL remained intact. 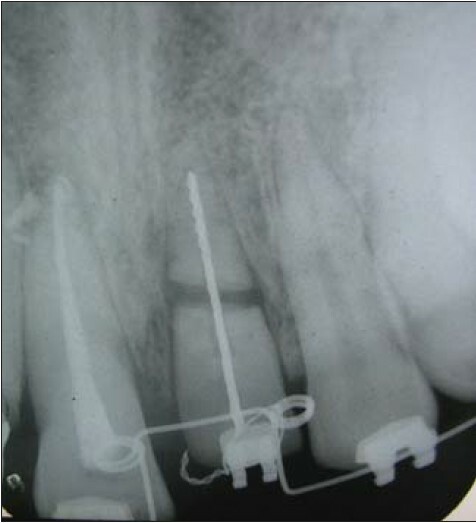 Endodontic treatment of the tooth was decided and the canal was negotiated with a small size reamer #15. As the coronal segment was mobile it was manipulated with the same reamer so as to bring it in line with the apical segment line of the apical segment [Figure 3]. The canal was enlarged to a size of 60 at working length with copious irrigation with 3% sodium hypochlorite. The reamer #60 was then smoothened above the fracture line to avoid interference during the movement of the coronal segment apically. Calcium hydroxide was placed in the canal to induce a hard tissue closure between the fractured segments. Reamer was then cut at the coronal reference point and seated in the canal [Figure 4]. 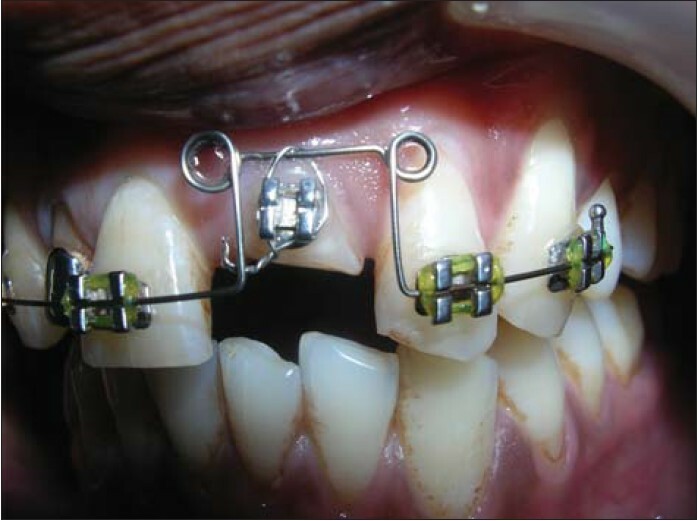 Orthodontic appliance was used to intrude the coronal segment towards the apical segment [Figure 5] and [Figure 6]. Coronal segment approximated the apical segment [Figure 7] in 2 month time period. The reamer was seen protruding out from the access preparation or the reference point [Figure 8]. 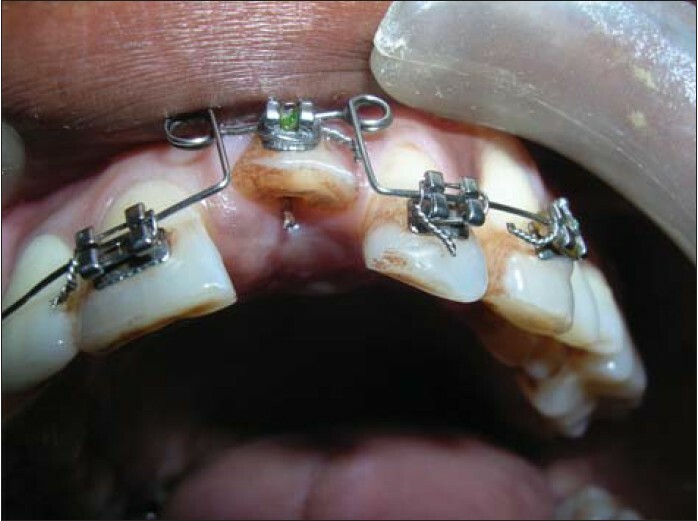 The orthodontic appliance was kept in position for another 1 month for stabilization of the coronal segment. As the length of the apical fractured segment was 6.5 mm, sectional cone gutta percha obturation was done using AH-26 sealer, up to 4 mm of the canal after removing the reamer [Figure 9]. A translucent fiber post was cemented in the canal with the help of dual cure resin cement. This fiber post occupied about 2.5 mm of the fractured apical segment of the root [Figure 10]. Subsequently a core was developed [Figure 11] and [Figure 12]. 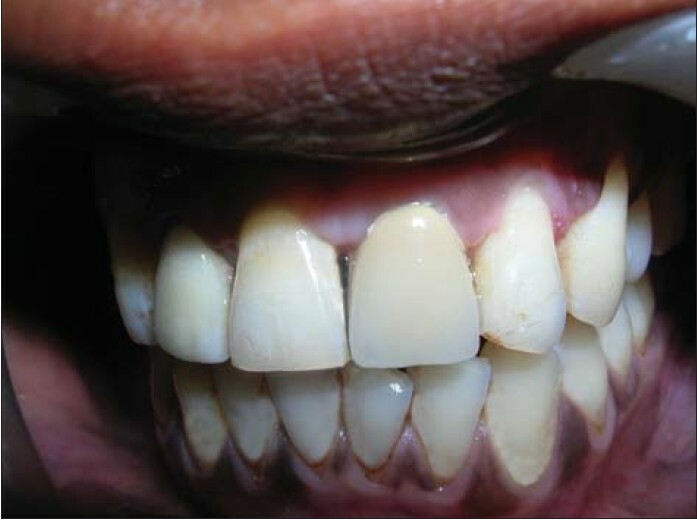 A porcelain fused to metal crown was delivered after 1 month [Figure 13] and [Figure 14]. 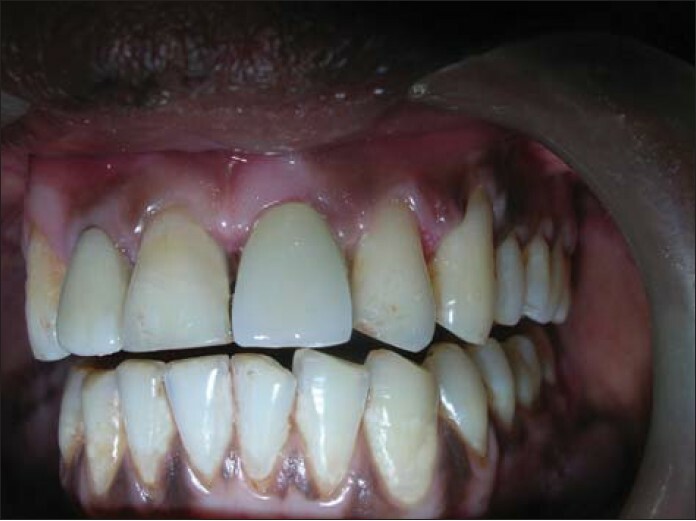 After 6 months, clinical and radiographic examinations showed a stable reattachment of the fragments, good esthetic and periodontal health [Figure 15] and [Figure 16]. A variety of traumatic conditions can cause root fractures, although the literature shows some predominant causes such as falling while playing and running, during sports activities, and blows received on the face. Hovland,  reported that horizontal root fractures in the permanent dentition comprise from 0.2% to 7% of all traumatic injuries to teeth. Maxillary central incisors are most vulnerable to injury, sustaining approximately 80% of all dental injuries, followed by the maxillary lateral and the mandibular incisors. The most common types of root fractures are in the middle third of the root (57%), followed by fracture in the apical part (34%), and in the coronal part (9%). If the fracture line is in communication with the oral cavity, the immobilization is difficult and microbial contamination of the pulp with subsequent pulpal necrosis is almost inevitable. Root canal therapy is indicated when vitality control reveals non-vital pulp tissue, or if the patient complains of pain or discomfort of the tooth. 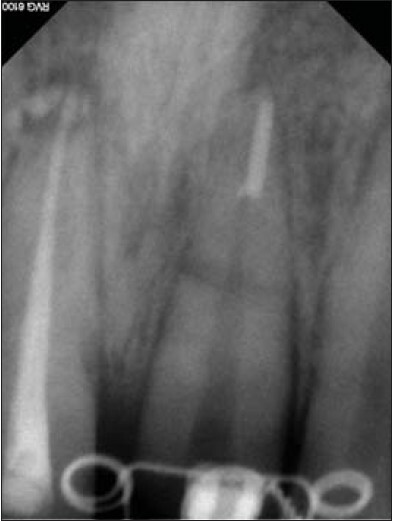 , Successful management of root fractures often involves a multidisciplinary combination of endodontic, orthodontic, periodontic and prosthetic therapy. , Repair appears to depend on an intact periodontal ligament, from which the hard tissue forming cells originate. If root fracture is diagnosed, emergency treatment involves repositioning of the segments in as close proximity as possible and fixing in position with a splint to the adjacent teeth for 2-4 months. The prognosis of root fractures depends on the state of the pulp tissue, occlusion, dislocation of the fragments, and the general health of the patient. In our case, maxillary left central incisor had dislocated or undergone dislocation. We repositioned the coronal segment of maxillary left central incisor with the help of reamer and orthodontic appliance. The splint was maintained in position for 1 month after the fracture segments approximated. The prognosis for tooth survival following a horizontal root fracture can be summarized as quite good. In a recent study on fractures in the middle and apical parts of the root, splinting of the luxated coronal fragments and the duration of splinting were found to be of minor importance, whereas factors such as root development, pulp sensitivity and repositioning of dislocated fragments were highly predictive of the frequency. In the present case, 6 months after the injury, the endodontic treatment was considered successful because following signs were absent: clinical symptoms, periradicular radiographic pathology and abnormal mobility. The initial treatment consists of repositioning the coronal segment and then stabilizing the tooth to allow healing of the periodontal ligament supporting the coronal segment. 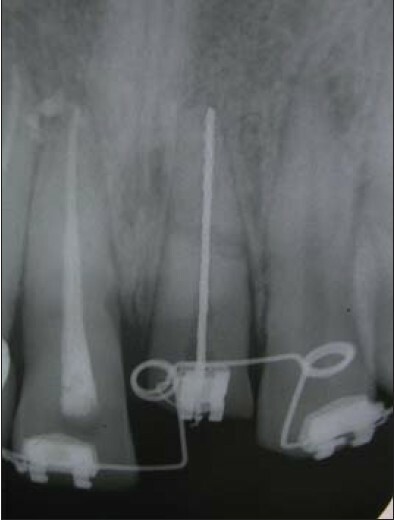 This case illustrates one alternative to treating and managing a horizontal root fracture. There are other options for treatment. Proper endodontic consultation allowed this patient to retain his natural tooth, save considerable time and money and be back to complete function in a matter of a few weeks. 1. Oztan MD, Sonat B. Repair of untreated horizontal root fractures: Two case reports. Dent Traumatol 2001;17:240-3. 2. Poi WR, Manfrin TM, Holland R, Sonoda CK. 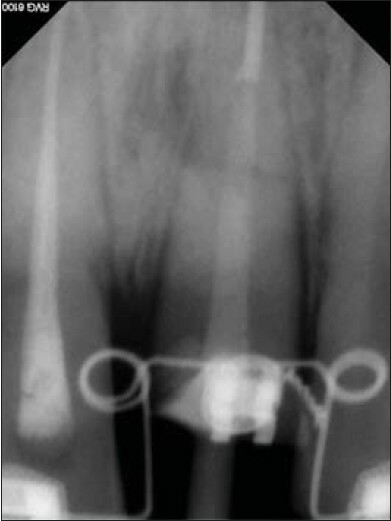 Repair characteristics of horizontal root fracture: A case report. Dent Traumatol 2002;18:98-102. 3. 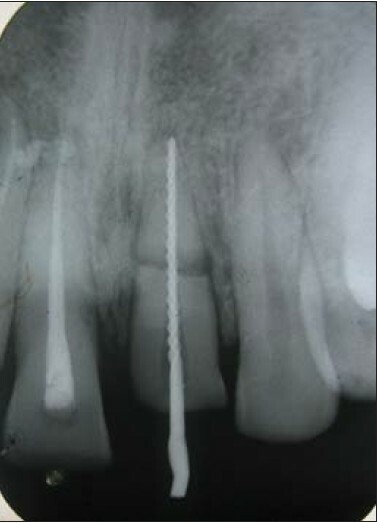 Clark SJ, Eleazer P. Management of a horizontal root fracture after previous root canal therapy. Oral Surg Oral Med Oral Pathol Oral Radiol Endod 2000;89:220-3. 4. Camp JH. Management of sports-related root fractures. Dent Clin North Am 2000;44:95-109, vi-vii. 5. Feely L, Mackie IC, Macfarlane T. An investigation of root-fractured permanent incisor teeth in children. Dent Traumatol 2003;19:52-4. 6. 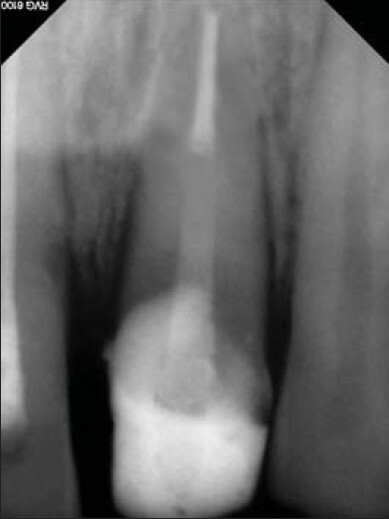 Gomes AP, de Araujo EA, Gonçalves SE, Kräft R. Treatment of traumatized permanent incisors with crown and root fractures: A case report. Dent Traumatol 2001;17:236-9. 7. Artvinli LB, Dural S. Spontaneously healed root fracture: Report of a case. Dent Traumatol 2003;19:64-6. 8. Hovland EJ. Horizontal root fractures. Treatment and repair. Dent Clin North Am 1992;36:509-25. 9. Andreasen JO. Traumatic Injuries of the teeth. 2 nd ed. Philadelphia, PA: WB Saunders; 1981. p. 119-50. 10. 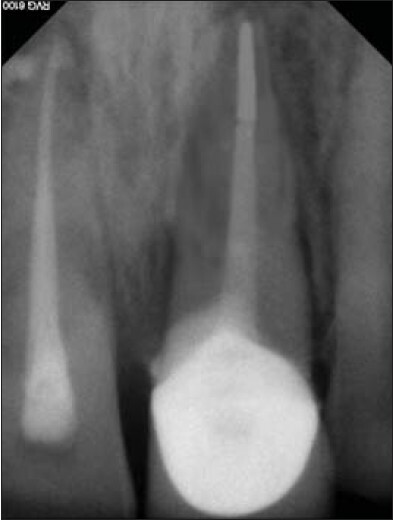 Andreasen FM, Andreasen JO, Bayer T. Prognosis of root-fractured permanent incisors - Prediction of healing modalities. Endod Dent Traumatol 1989;5:11-22. 11. Gábris K, Tarján I, Rózsa N. Dental trauma in children presenting for treatment at the Department of Dentistry for Children and Orthodontics, Budapest, 1985-1999. Dent Traumatol 2001;17:103-8. 12. Andreasen JO, Andreasen FM, Bakland LK, Flores MT. Traumatic Dental Injuries - A Manual. Oxford: Blackwell Munksgaard; 2003. p. 10-5. 13. Andreasen JO, Hjorting-Hansen E. Intraalveolar root fractures: Radiographic and histologic study of 50 cases. J Oral Surg 1967;25:414-26. 14. Erdemir A, Ungor M, Erdemir EO. 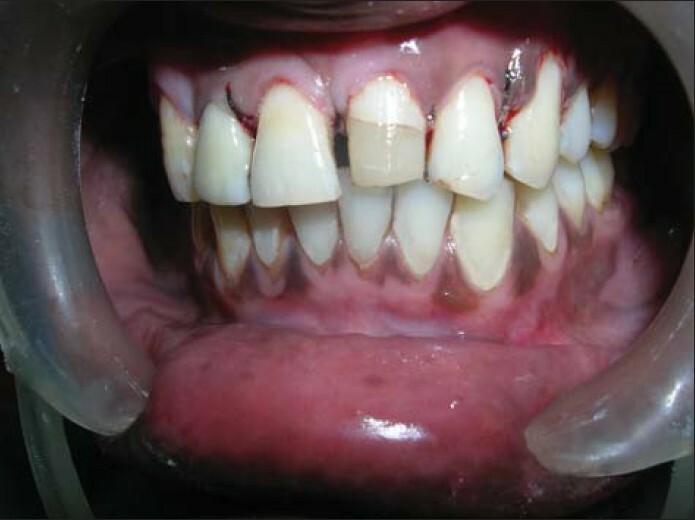 Orthodontic movement of a horizontally fractured tooth: A case report. Dent Traumatol 2005;21:160-4. 15. Trop M, Chivian N, Sigurdsson A. Traumatic injuries. In: Cohen S, Burns RC, editors. Pathways of the Pulp. St.Louis: Mosby; 1998. p. 567-72.